In recent posts I have been looking at the potential for the historically high producing Saudi oilfields at Abqaiq, Berri and Ghawar to increase, or even sustain current levels of production into the future. This is particularly important when one considers the historic main oilfields in production within that country. And of these the largest not yet covered is the offshore field at Safaniya, today's topic. Because of the change in well design, so that long horizontal wells, many with a number of lateral feeds, known collectively as Maximum Reservoir Contact (MRC) wells, located within the top 5 ft of the reservoir are now used, initial declines in production in the major fields have largely stopped. This is partially explained because as a vertical well through an oil reservoir sees the pool getting smaller, the length of well productively exposed to the oil in the reservoir reduces, and so there is a steady reduction in well performance over the years. Where the oil is, however, being pushed up to the horizontal well by an under-flood of injected water (which sustains the differential pressure between the fluid in the rock and the well bore) then the exposed length, and the driving pressure both remain relatively constant, and production is sustained at closer to a constant level until the water flood reaches the well, when the well dies. Aramco have changed the design of their MRC wells so that the arrival of water at one location along a lateral is no longer sufficient to kill the well. Installed valves isolate the region of the well where the water enters, and the rest of the well can remain in production. But it will produce at a reduced rate, and is an early warning that the water levels are nearing the well location, and that, before long, the well will no longer be able to sustain the x,000 bd production which has been the characteristic of most Saudi wells for over five decades. This is not to decry the efforts that have been made to recover residual oil left in those fields. As I have noted Aramco have been diligent in seeking to find additional ways to extract the oil that has been left as the waterfloods progressed through their senior fields. But they are also smart enough to know that alternate fields would have to be developed, and brought on line as the limits in the older fields are reached, as they now have been, in some cases for years. There is an interesting feature to the sources of production, back in 1994. The immediately obvious characteristic is that they are, at least to some degree (as with Berri) land-based. (Other less obvious differences are a change in the host rock and the quality of the oil). The most significant of the remaining four is Safaniya which came on line in 1951. But it was not, immediately, produced. Aramco, in accordance with the terms of its concession, went ahead with the careful development of the field. Between 1951 and 1954, 17 wells were drilled, but they were not produced. . . . . . When it was first put in production in 1957, it flowed 50,000 barrels of crude oil a day from 18 wells. At the beginning of 1962 it possessed the facilities to handle 350,000 barrels a day (almost 128 million barrels a year) from 25 wells. It was found to be the world’s largest offshore oilfield, and Matt Simmons has conjectured (in Twilight in the Desert) that it is connected to Khafji and through that field into Burgan. When Saudi oil production peaked in 1980/81 he notes that it was producing at over 1.5 mbd. Since then production fell to around 600 kbd, but then has increased back to 900 kbd with plans now afoot to bring it back up to full volume of earlier levels of production, which will require additional forms of artificial lift this being the electrical submersible pumps that have already been introduced into Ghawar. . . .holds the entire remaining spare daily oil supply of any magnitude . . In the sense that other fields and opportunities take a little time to bring on line this remains true. Manifa, for example, will only start to bring in significant production as the refineries to accept the oil are themselves brought on line in the years ahead. Yet it is still counted as part of the total volume that KSA can bring to the market. Safaniya had, however, been integrated with secondary development of the nearby fields of Marjan and Zuluft into a Northern Area Producing Region (NAPR) back in 1995 and there are enough wells and Gas Oil Separation Plants available, to be able to handle flows of up to 2 mbd. Because, however, the oil produced is Heavy (relative to the Arab Light classification of the production from the land-based reservoirs initially) Aramco also found it sometimes more difficult to market, though that demand also fluctuates. And it has been this marketing problem that sometimes seems to produce the headlines when Aramco sees a world that is increasingly demanding more oil, but has not always been willing to use this heavier supply as an immediate fill-in for existing shortages. (It could not, for example, provide an immediate replacement for Libyan oil last year, even though it was available). As a result the heavier oil is discounted against other Saudi oil. 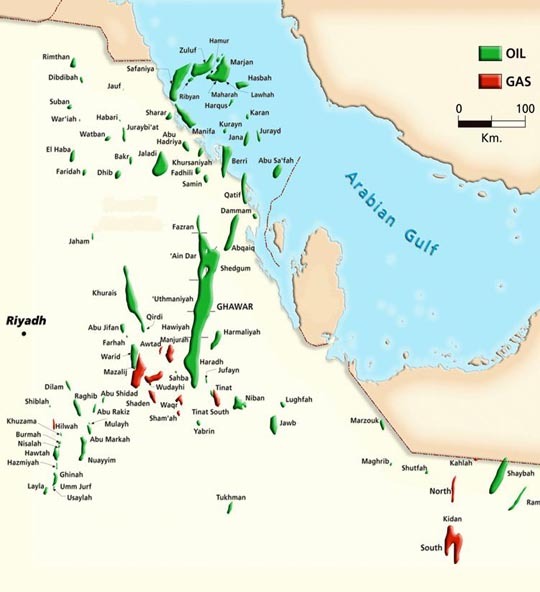 At present the major effort offshore is going toward development of Manifa, which will ultimately bring an additional 900 kbd into production (staged to coincide with refinery construction) but as those wells come on stream (starting next year) so the effort will swing back to Safaniya, Marjan and the related fields of the NAPR. (And as an aside I had mentioned at the beginning of this series of posts there was some talk of bringing Damman back into production, and those talks are apparently still continuing). This additional production capability will, with the further development of some of the other fields in the region (which I will discuss next time) leaves me believing that, of the three largest oil producers, it will be Saudi Arabia that sustains its current levels of production (give or take 500 kbd) much longer than its two rivals. Though I would again stress the difference between production and export volumes. تعرف الان على اسعار شركة نقل عفش بمكة التى تتبع شركة الاخلاص والامانه لتختار ما يناسبك لتتمكن من نقل العفش والاثاث من مكان الى الاخر حيث اننا افضل شركات نقل عفش في مكة المكرمة ونعتمد على اليات واساليب حديثة للنقل وهذا يجعل الاخلاص والامانه افضل شركة نقل العفش بمكة المكرمة بالاضافه الى التميز والخبره في النقل السريع . تواصلوا مع اكبر شركة سفلته طرق ومتخصصه في مجال لسفلته والمقاولات العامه في جميع انحاء المملكة العربيه لسعودية علي اعلي مسوتيات الامانه والدقه. نقدم لكم افضل خدمات صيانة وايت ويل وخدمات صيانة وستنجهاوس التي تقدم افضل الخدمات لصيانة الاجهزة الكهربائية في جميع مدن ومحافزات جمهورية مصر العربيه علي اعلي مستوي . اقوي خدمات الصيانة المقدمة من صيانة يونيفرسال المعروفه في مجال صيانة وبيع الاجهزة الكهربائية علي اعلي مستوي من خلالنا فقط في جميع محافظات واماكن جمهورية مصر العربيى علي اعلي مستوي من خلالنا فقط. نقدم لكم اكبر شركة مكافحة الحشرات في جميع انحاء جمهورية مصر العربيه من خلالنا فقط في مصر حيث ان الشركة الفرنسيه تعد من اكبر واشهر شركات ابادة الحشرات في جميع انحاء مصر علي اعلي مستوي. نقدم لكم الان اكبر خدمات مركز صيانة يونيون اير ومراكز صياناتنا المنتشره في جميع محافظات وقوري ومدن جمهويرة مصر العربي علي اعلي مستوي صيانات في مصر ومن خلال افضل فريق مهندسين صيانة متخصصين في تصليح اقوي الاعطال في مصر. الان يمكنك التعرف علي المزيد من خدمات صيانة ويرلبول والتي تعتبر من اهم واكبر مراكز الصيانة المعتمدة في مصر التي تعمل باحدث قطع غيار الاجهزه الكهربائية الاصلية والتي يمكنك التواصل معها يوميا وعلي مدار ال 24 ساعة من خلال خدمة عملاء ويرلبول كل ما عليك هو التواصل معنا في اي وقت ومن اي مكان عبر رقم ويرلبول في اسرع وقت الان .